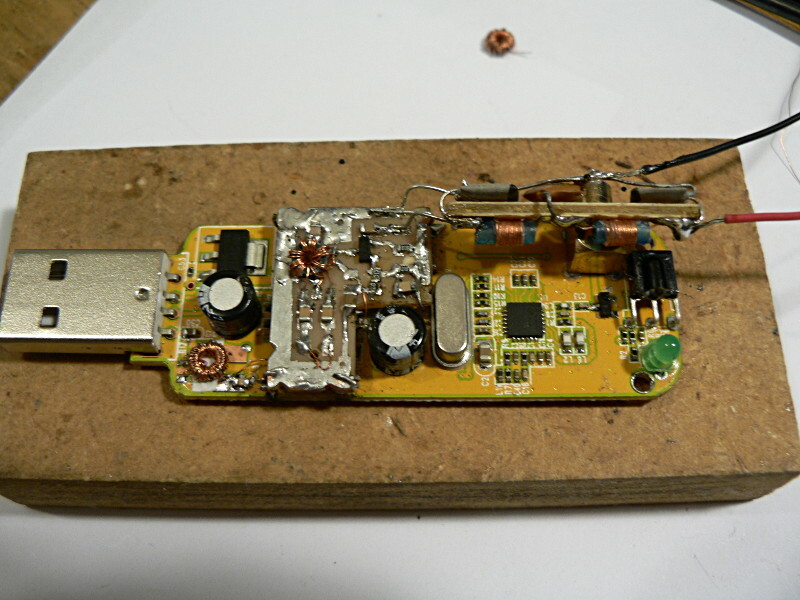 Over on the Reddit RTL-SDR discussion board user pksato has posted an image of his direct sampling modified RTL-SDR dongle. His mod includes a simple common base amplifier with 9dB gain, an impedance transformer with calculated output impedance of 50 Ohms and a 5V power filter. 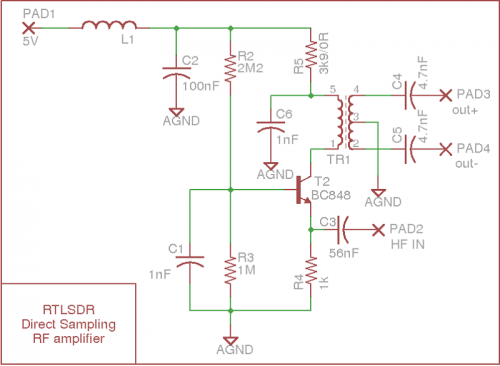 The direct sampling mod allows you to modify your RTL-SDR to receive HF frequencies, without the need for an upconverter. It requires a hardware mod that can be as simple as soldering a wire to one of the RTL2832U pins, but for improved results you will need filters, impedance transformers and amplifiers. There is more information about direct sampling here. More information and images about pskato’s mod can be found on the Reddit thread. We also note that amateur radio hobbyist KN0CK (aka Marty Wittrock) sells direct sampling modified dongles that are modified in a similar way to pskato’s mod (circuit placed on top of the RTL-SDR PCB). His products can be found at http://www.kn0ck.com/HF_SDR/. Direct sampling mod with amplifier circuit schematic by pskato. Why 50 ohms matching when the dongle is 75 ohms? Looks difficult…micro circuits(dongle pcb)mini baluns and its miniture windings burnt fingers lead poisoning and solder blobs on my new jeans melted the power cord on my soldering iron which in turn blew the fuse,gone boss eyed looking through a magnifing glass for 45 minutes in frustration i bought a $20 upconverter from cosycave instead.My only regret is i should have bought this in the first place.